I like watching basketball. It's a more intimate game than soccer, baseball, softball or football. The fans are so close to the action. What I like the most is that I can see the determination on the faces of the players who are in it to win it. I watched my daughter play basketball on Thursday and Saturday this week. On Thursday, her 4th grade team was playing against all 5th grade team. The difference in size between the two teams was considerable. The 5th grade team intimidated CC's team and beat them by a wide margin the first time they played two weeks ago. The final score, however, did not tell the entire story. In the second half of that game our scrappy girls outscored the 5th grade team and gained some confidence. In the rematch Thursday, our girls came out fighting early and led the entire game. The excitement in the stands was incredible. 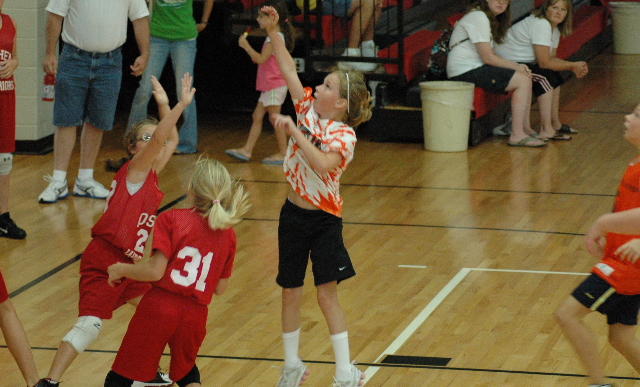 The 5th grade parents were complaining that the 4th grade girls were fouling too much. The parents of the 4th grade team were yelling back. They felt compelled to remind the 5th grade parents that the 4th graders are much smaller. They should have just ignored the other parents. The parents were trying to ruin an incredible game. I was most impressed with my daughter's will to win. I was also impressed with the will to win from the twin tower twins on the other team. Both girls a full 12 inches taller than my daughter, clearly did not want to lose to a younger team. 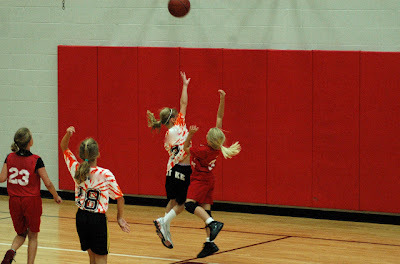 My daughter played the entire game because several girls including the backup point guard were on vacation. Her energy level never diminished when it counted even though it looked like she was going to throw up. Her desire to drive the lane never diminished even though she was getting beat up. She clearly wanted to beat the older team. You could see it on her face. I could feel her will to win every time she made eye contact with me as the game went to overtime. The 5th grade team had tied the game at the end of regulation and then won on a free throw with 2 seconds left. CC's team lost but it was a moral victory against a much bigger team. Saturday morning CC played against the best coached team in the league. The two best girls on that team are her teammates on her elite soccer team. It was fun to watch them battle each other. My daughter wanted to beat her friends just as badly as she wanted to beat the 5th grade team. Unfortunately, her team was no match for the other team and CC's team fell behind 18-0. The well coached point guard from the other team schooled our team. She would pass the ball then break for the basket for a classic give and go. My daughter's attention was diverted in the direction of the pass. Finally, I yelled to CC to cover the passer instead of the player receiving the pass. The coach heard this and reinforced this concept. CC understood and marked the passer. The coach also worked some pick plays to free CC to shoot more. These two tactics turned the game around and CC's team ended up outscoring their opponent 11-8 in the second half. CC scored 8. 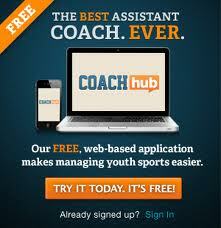 Basketball is a great game for parents to watch. You can see the sweat. You can see the dogged determination of the kids who want to win. Some kids want it more than others. As the game gets longer and the gym gets hotter, the kids with the will to win are easy to pick out compared to the other players. I believe that the will to win is innate. Some people are born with it, most were not. My daughter has it.